You wouldn’t know it by looking at my house, but I actually dislike mirrors. I mean, I think they’re pretty and great for bouncing light around a space but I don’t like seeing myself at every turn. My mom always told me growing up that if you want to feel good about yourself then only look in the mirror in the morning and then avoid them for the rest of the day. I totally get it now. Every time I see my reflection staring back at me it makes me cringe a little. I’m not yet 30 but I can see my face is running a little ahead of schedule. It doesn’t make it any better that my husband has “stretchy skin” (seeeeriously. Its like he was infused with flubber in the womb) and there are yet to be any signs of wrinkling on his perdy face. Good thing he’s at least losing his hair. Or I might have to get botox. 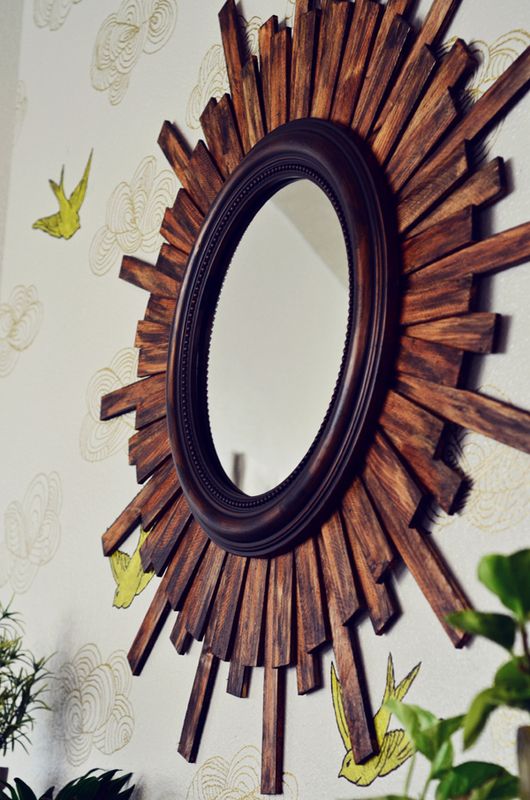 If you like this, check out my other Driftwood Sunburst Mirror, or my DIY Sunflower Mirror. 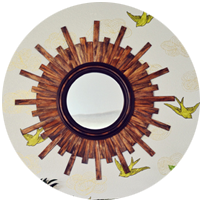 Also, be sure to check out my post on DIY Faux Wallpaper to learn how I created the birds and clouds wall treatment. A large round mirror. The one I found was 20”, framed, and from Walmart for $10. Long and short packs of wood shims. I got about 3 packs of short and 2 packs of long and had leftovers. 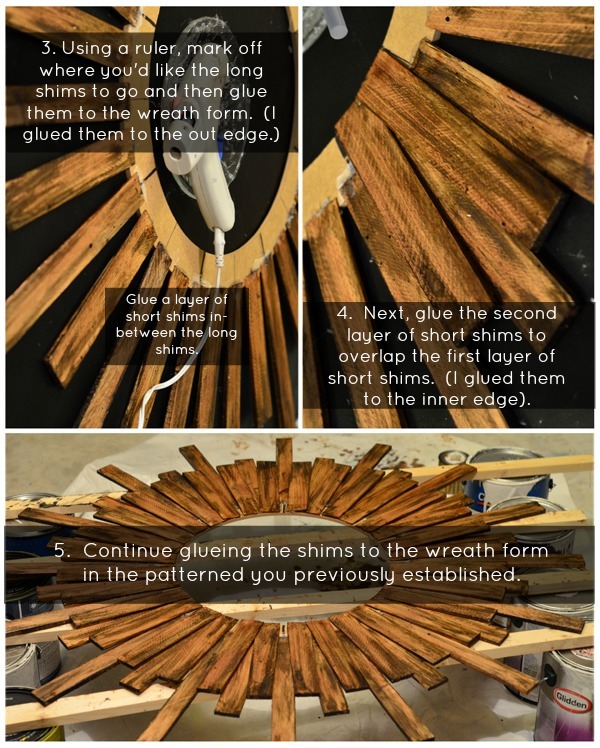 1 18” (or so) wooden wreath form. I found mine at Michaels in the floral department. 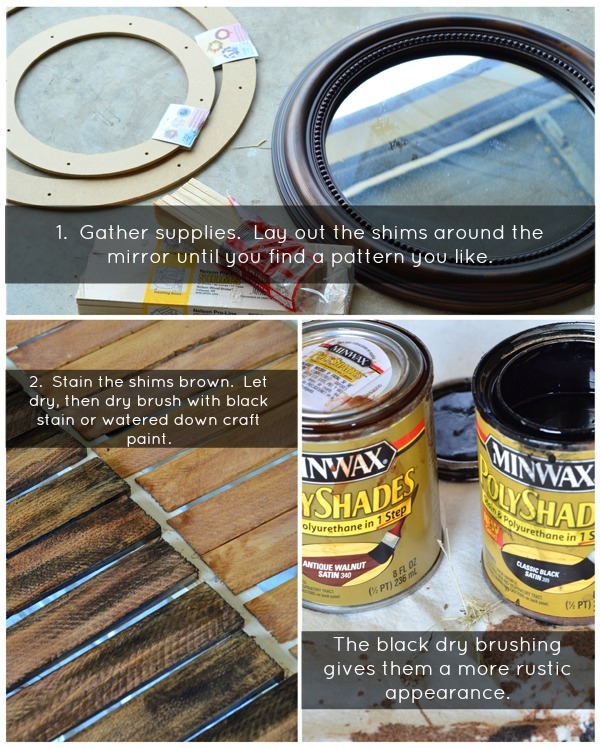 Wood stain. I used a brown stain and then a little bit of black stain (I assume you could also use watered down craft paint in place of black stain). Misc. supplies: rags, picture hanging kit, etc. Like this? 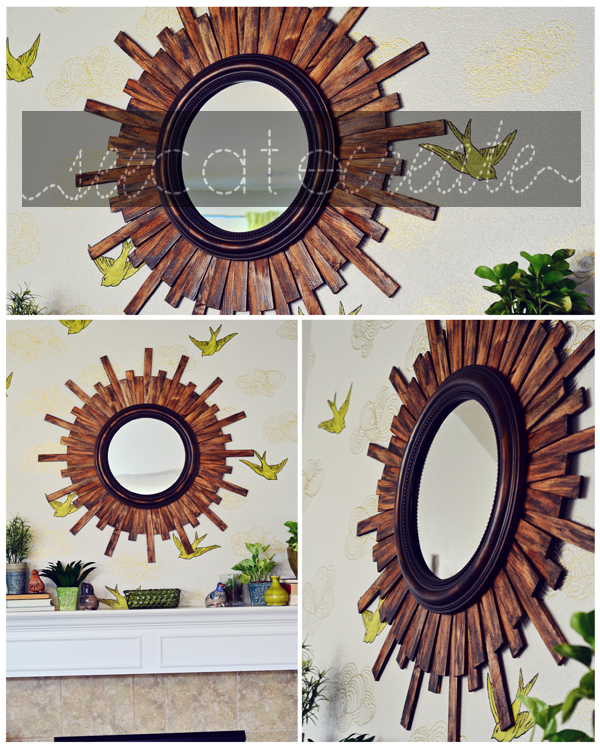 Well check out my driftwood starburst mirror tut here and my sunflower mirror tut here.